Despite the Federal Government’s approval of additional N64.1 billion for new features in the Lagos-Ibadan Expressway, the question many are asking is: will the road ever be delivered? The Nation's Adeyinka Aderibigbe reports. The Lagos-Ibadan Expressway has, more than any other highway, gained the attention of Nigerians and successive governments. Eighteen years on, the road has featured on the to-do-list of the Federal Government which continues to pump money into it to make it safe for road users. Fixing the road, which is gateway from Lagos to other parts of the country, is becoming expensive. Before Messrs Julius Berger Plc and Reynolds Construction Company (RCC) Plc were hired by the Government in 2013, the 127.6-kilometre highway was at best a deathtrap. The contracts were awarded for N167 billion with a completion date of 2017. The two firms were hired following the failure of Bi-Courtney Highway Services Limited (BHSL) to fulfill the agreements it reached with the government on the project. The N91 billion contract awarded to BHSL was terminated on November 19, 2012. If the concessionary agreement the Federal Government signed with BHSL in 2009, had worked out, the company would have managed the highway for 25 years under a Public Private Partnership (PPP) arrangement. Bi-Courtney had a mandate to reconstruct and expand the expressway and recoup its investment through tolling and advertisement rights. The government said the action was taken because of the failure of Bi-Courtney. Since Julius Berger and RCC were mobilised by the former administration of Dr. Goodluck Jonathan, the contractors have been on and off the sections allocated to them, a development that made last year’s delivery date impossible. 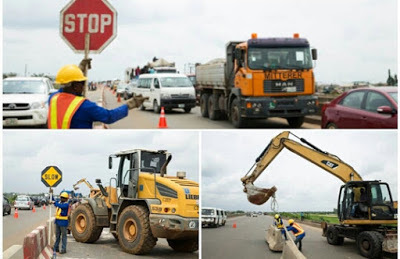 But the approval of additional N64.1 billion by the Federal Executive Council (FEC) at its weekly meeting week, the Muhammadu Buhari government seems poised to complete the reconstruction of the Segment ‘A’ of the highway. The section from Lagos to Sagamu Interchange was initially awarded to Julius Berger for 70 billion. Announcing the latest development, the Minister of Power, Works & Housing, Babatunde Fashola, said the new funds would address the changing nature of the road. According to the minister, the increased human activity on the corridor, especially the Lagos-Sagamu segment, occasioned by the mushrooming of religious institutions, factories, universities and farm settlements, informed the need to change the inherited design. He said the inherited design has become obsolete. The new approval, Fashola explained, is designed to modify the bitumen for the road in order to withstand pressure from heavy duty vehicles plying the road and to cover the construction of pedestrian bridges and toll plazas. As at the time of filing this report, there was now news on when the Messrs Julius Berger should return to site. Neither has the government announced a new deadline for the completion of the project. The multi-billion naira project is stucked- no thanks to the inability of the Federal Government to adequately fund the project. After rewarding the project in 2013, the Jonathan administration pledged to release N50 billion. But instead, the government provided only a guarantee to the Infrastructure Bank to facilitate the release of N117 billion to Julius Berger and the RCC. The two construction were unable to get up to N10 billion, a development that forced the firms to withdraw their gangs from the road. The bank, it was learnt, was trying to limit its risk exposure because the BHSL had approached the court to challenge the termination of its contract. The case was determined in favour of the government in a Federal High Court on April 25, 2016. The Federal Controller of Works in Lagos, Mr. Fred Kuti, said a clearer picture of the details may not come until next month. If the ministry will get the extract by mid-May, mobilising Julius Berger and returning to site may not be earlier than June. A transport expert, Dr. George Banjo, said the real issue is not when the project would resume, Nigerians are anxious to know when it would be delivered. The reason for this is not far-fetched. The road in its present state has become the nation’s most prominent death trap, claiming lives on a daily basis. Saluting the government for the new design going on the road, George, a former World Bank Consultant on Transportation, said the road’s upgrading is long overdue as the road used to be a rural motorway. George urged the government to put its overall plan on the road to the public domain. “Until such is done, it would be difficult to fault the government on this new initiative as it simply showed that it is not immune to those needs that might make it return to the project sooner, if it had delivered it because of the need to prevent lives of other road users as well as ensure the longevity of the road. For now, it is a step in the right direction,” George had said. Echoing him, another transport planning expert, Dr. Joseph Shojobi, called for the implementation of a new template to manage the nation’s basic commonwealth. According to him, a fundamental reform such as the return of all roads to the state governments must be undertaken, to take the shine away from the regular ritual of announcing hefty sums for the construction and rehabilitation of roads. He said: “This should be followed with the re-classification of the roads and the growth of dedicated funds by the reintroduction of the tolling regime to ensure regular maintenance of the roads. “We must make tolling part of our culture. It must be a consistent policy, if we are to ensure we have motorable road all year round. “Let the government come up with an agency or corporation to handle our roads. This agency must statutorily collect at least two percent of the cost of construction of any new road as well as fuel tax and tolls. “Everywhere in the world, the usage of the road is not free. We must get the tolling regime back and also get to introduce fuel consumption tax. Consumers must be able to pay between one or two percent tax on our daily fuel consumption. That is what obtains in the United Kingdom (UK), the United States (U.S.), Germany and other partsof Europe. “The beauty of such a fund is that the country would not have to wait for yearly allocations to fix any road because the special agency so created to warehouse the money would have enough to maintain all road networks and construct new ones across all the six geopolitical zones of the country. Shojobi, who recalled that the country was able to pay for the construction of the road in the 60s without recourse to the World Bank, said the country would not have gotten into the cesspool, if the government had cultivated the culture of tolling of its highways. To prevent the cankerworm of corruption from sinking its fangs into the agency, Shojobi called for the decentralisation of its operations and the use of professionals and consultants. He said the new template would provide a new gust of wind into a sector that is exemplified by dilapidated infrastructure.